Earlier this month — July 2, 2015, to be exact — I received the largest single shipment of model railroad equipment so far, but by no means the most expensive shipment. And, therein lies a tale. A very large box containing a Roco 41375 start set came inside an even larger giant box from Reynauld’s that also contained a few other backordered items from previous orders, including some long pieces of track. Unpacking the start set was like Christmas in July. A Roco catalog illustration for start set 41365. This illustration does not show all the items included in the set. All of these pieces together cost only slightly over $200! As I am writing this in 2015, but the Blog post may well end up being on the Web site for a number of years and being read in a subsequent year, I need to point out the following: Prices mentioned may fluctuate for a variety of reasons, and most model railroad manufacturers will vary the content of start sets from year to year. But, the general concepts discussed here will certainly continue to hold true. I need to note that I already had a Roco model of an Austrian 2048 locomotive (with a different operating number) as well as many feet of track (and switches) from a different track system. I also already had a Multimaus and amplifier, which had given me my start with digital operations. And, I have quite a large collection of other rolling stock. So, why would someone already fairly far along in model railroading purchase a start set – and wait for it for nearly half a year? I had initially ordered this set in January of 2015, knowing that it would not be available until much later in the year. The basic reasons were that (1) I wanted most of the items in this set for my future layout, and (2) the price, as is generally the case with start sets, was a fantastic bargain. I had given the choice of this particular start set a lot of thought. You can, however, use two Multimaus controllers off the same amplifier. So, my plan is to leave the first amplifier upstairs in my work room, connected to my test/programming track. The second (new) amplifier will go to my layout downstairs, and ultimately be supplemented by one or more boosters. A Roco Multimaus digital controller. I was happy with the detailing and running characteristics of my existing 2048 (though it will need to be converted to digital), so a second engine with a different operating number would fit in just fine. Austria’s 2048 diesel switchers were a re-engined version of the German V100 family, actually used locomotives of the DB class 211. In the 1990s, the Austrian Federal Railways (ÖBB) found themselves short of motive power after implementing an interval schedule (passenger trains would operate at exact one- or two-hour intervals on most lines). That meant that most existing diesel locomotives with head-end power (generators for passenger car lighting and heating) were now needed for passenger service. Additional new modern diesel locomotives were on the drawing board, but would take years to arrive. So the ÖBB decided to buy reconditioned used diesels as a stop-gap measure. The locomotives, designated as class 2048, were equipped with new Caterpillar diesel motors and repainted into the then-current ÖBB paint scheme, but retained most other existing equipment. They did not have a head-end power generator, so they were used almost exclusively in freight service, though they could also be used for switching in passenger terminals. Some Austrian locomotive engineers reportedly liked the 2048 engines better than the brand new class 2070 that began arriving between 2001 and 2003. The 2048 locomotives that were placed in service between 1991 and 1994 were all superfluous by 2003, and were again sold off by the ÖBB, many for use in larger industries, where some retained their ÖBB paint scheme. I’ve mentioned before that I plan to set my layout – actual construction of which is getting closer and closer -–at the end of V and beginning of Era VI. That would be around 2006-2007, with a lot of equipment still looking the same as it did in 2001 or so. In the real world, the 2048 locomotives would have been gone from the ÖBB rosters. However, I don’t plan to use them as ÖBB switchers. A large industry on my planned layout will be the maintenance base of a large (fictitious) railroad maintenance and construction contractor. That contractor would be switching both within its maintenance facility and operate construction trains out on the mainline. So, the locos will get small stickers with the contractor’s logo – and keep their original numbers. That’s actually not that far from the truth, as in their final years class 2048 locomotives were used primarily in work train service. Yes, I was pleased with the contents of this huge package. Needless to say, the loco was quickly programmed with its own address, oiled, and had Roco Universal Couplers installed (as was the case with the hoppers.) The engine has already run for several hours on my test loop. Unlike what I’ve seen in start sets from some manufacturers, the contents of this set were by no means “cheap” equipment. The loco used toolings that had been around for a while, but it is nicely detailed (as are the hoppers), and all the pieces run beautifully. Would I recommend this start set or a similar one (Roco offers several other start sets in the $200-300 range – as well as some more expensive ones) to others, particularly to someone just starting out in model railroading? Certainly. Of course, I would urge any potential purchasers to look carefully at the components of any particular start set to see how they match your particular interests and plans for a future layout. But, a couple of things did give me pause: First, the items in this start set would have fit in a somewhat smaller box. I assume that this is the result of Roco trying to standardize on packaging for their start sets, whose components will vary somewhat in size. However, what gave me the most pause was the documentation. About the only thing addressed to beginners was a sheet showing how to plug all the digital components and cables together. Thank you for selecting this Roco start set. This sheet will help you get started quickly. That start set includes powerful components that will ultimately allow you to operate multiple locomotives on the same track – without complex wiring – and to operate switches and other devices remotely. However, you do not need to worry about most of these features or to understand them to begin operating your train immediately. This set includes a variety of documentation. Be sure to preserve all of it for future reference when you begin using additional features. In digital operation, commands are sent to locomotives and other operating devices via device addresses. If you do not currently have any other digital locomotives, you do not have to worry about these addresses. Both the locomotive and digital controller are pre-set to address 3. This allows the controller to immediately communicate with the enclosed locomotive. Simply connect the components and track as shown on the enclosed sheet. As described in the instruction sheet specific to your locomotive, it is recommended that you briefly run your locomotive for a while in each direction without the load of any trailing cars. This helps break in the mechanism. You will also need to periodically oil the locomotive and cars as described in their respective instruction sheets. IMPORTANT: You cannot run non-digital locomotives with the equipment provided in this set. Placing a locomotive without a digital decoder on tracks with digital power will damage that locomotive. Consult your dealer about the possibility of converting analog locomotives to digital operation. Note that the sheet can be generic and work for a variety of sets with different locomotives, cars, or even track components. This is just a quick draft and can probably be improved upon. But it probably should be no longer than one or two pages. I would also provide a sheet with some basic information about the track system being used. 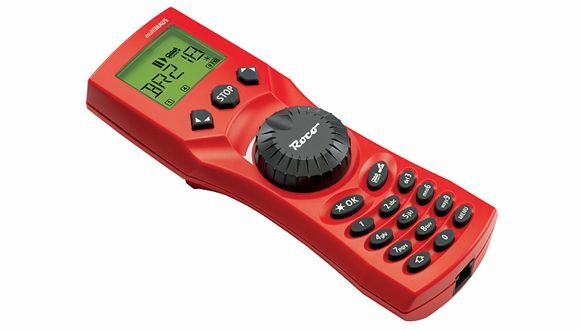 If you are just starting out with one of these Roco digital start sets, I would also strongly urge you to consider another Roco item (catalog number 51250) for around $200, a supplemental track set that includes four digital switches and the components for digitizing the switch provided with the original start set. This is another exceedingly good value. 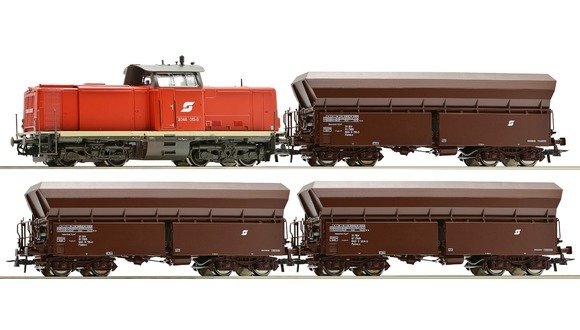 This supplemental set is a relatively new offering from Roco, taking into account that most new model railroaders are now starting out with digital equipment. It will quickly give you many more operating possibilities, particularly if you realize that you do not have to use the components in the double-track oval configuration illustrated in the catalogs. If you want to discuss the ideas presented here, please do so in the Reynauld’s forum.